And I think every wedding reception candy bar should have a bowl of rock candy. There is something so fun and nostalgic and whimsical about rock candy. It’s pure sugar which makes it awesome by candy standards. And, if you can find it in jeweled tones like the candy I’m featuring today that makes it even better! For the rest of the candy bar pick out wedding standards like Jordan almonds and mix in fun items like saltwater taffy, licorice, and even little chocolate kisses. 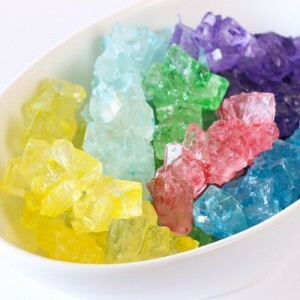 You can find this pretty rock candy here, along with other wedding candy.